Selecting a wedding venue is highly dependent on your finalized date. Once you’ve set the date chances are there may be availability issues. That’s when what style of wedding you wish to have becomes the next thing to discuss and decide upon. Do you wish to have a royal wedding? Or have a vintage wedding on mind? Or perhaps an elegant affair is your thing? For any and every style there is a wedding venue in Delhi. This week we list our favourite banquet halls in Central Delhi that are magical, mesmerizing and amazingly marvellous. You’re sure to find the one that matches your budget and your wedding style. A venue that creates just the right amount of magic you ever imagined your wedding celebration to be is the Shangri-La Eros Hotel. 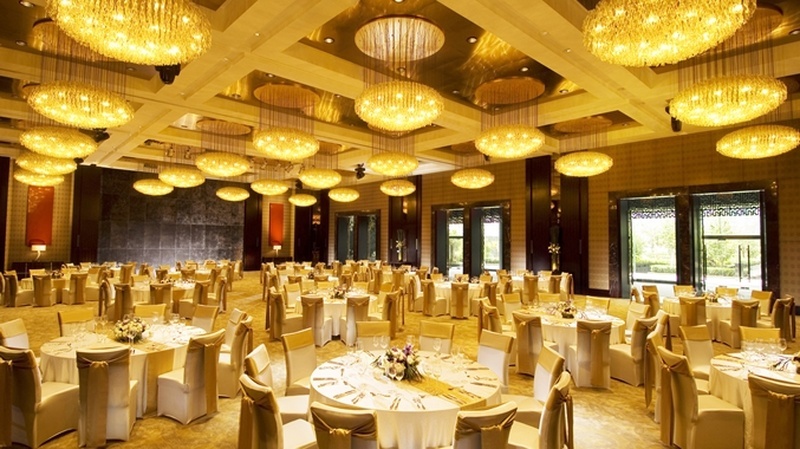 Their wedding venue is one of the most charming banquet halls in Central Delhi. Simply, because of their vintage interiors that is breathtaking. For couples who wish to have a lavish mehndi, sangeet or wedding ceremony with just their near and dear ones in tow, their banquet halls do complete justice to such specialized requirements. As a full-service wedding hotel, from decorations to catering, all wedding elements are closely looked after by their expert staff. You can get your own DJ to the venue to host a rocking sangeet or wedding reception party. With music allowed till late night, hands down this is you ideal wedding destination! India’s first luxury hotel, The Claridges is an ideal venue among the banquet halls in Central Delhi for couples looking for a wow experience. The venue offers stunningly designed banquet halls in Central Delhi, their Vice Regal is perfect for a small gathering pre-wedding celebration and Vice Roy can accommodate a medium sized wedding celebration. With a full-service hotel at your service, you needn’t worry about getting dazzling decor, mouth-watering cuisines and enthralling entertainment. The venue arranges everything for you under one roof. One of the largest banquet halls in Central Delhi with an event facility that can accommodate more than 3000 guests makes Hyatt Regency an ultimate destination for royal wedding affairs. With an event space of more than 40,000 sq. ft. and a ballroom spread over 20,710 sq. ft. of area; your big fat Indian wedding cannot get grander than this. The venue has their own expert chefs who create menus perfectly attuned to your tastes, while decoration is managed by well-known florists Ferns & Petals. The venue allows you to hire your own decor team and DJ for entertainment. Is a Venetian wedding on your mind? Bringing in the beauty of Venice and Rome in its interiors, The Royal Plaza offers the most magnificent banquet halls in Central Delhi. With multi-capacity venue spaces available, you can host all your wedding events, including mehndi, sangeet, ceremony and reception all in one location. As a full-service wedding venue, The Royal Plaza has got you covered for all your wedding related services. What’s Free? : One complimentary changing room is provided to the bride. An additional changing room can be arranged for the groom based on requirements. Why fly abroad for a destination wedding, when The Leela Palace in Central Delhi provides wedding venues that feature architecture inspired by the Lutyens. One look around the venue and you’re sure to be floored by the marvellous beauty each space has to offer. Transport your guests away to luxury from all the hustle and bustle of the city. Let their proficient internal wedding management team handle all your requirements closely. And while their decoration team will assist you in setting the right mood for your big celebration, their culinary experts drawing on their knowledge of regional and international cuisines create a customized wedding menu. The Leela Palace allows you to book your own DJ. What’s Free? : Changing rooms are provided to the bride and groom based on the number of guests. When you find a wedding venue that looks no less than a gold mine, you know you’ve found your treasure. Fitting the needs of metropolitan couples, Metropolitan Hotel that is located in the business district of Connaught Place provides one of the finest banquet halls in Central Delhi. Mesmerizing interiors welcome you at this wedding venue. Though ideal for a lavish mehndi, sangeet or cocktail party, you can also host an intimate yet grand wedding reception here. Excluding decoration, Metropolitan Hotel’s wedding specialist looks after all catering and entertainment requirements. With elegance offered all year round, Le Meridien is an absolute choice for couples looking forward to have a 5 star experience. 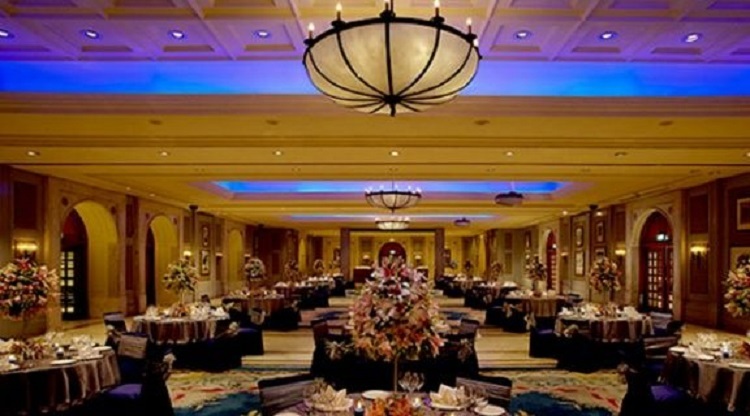 Their three exquisitely designed banquet halls in Central Delhi have their own private entrance and are fully-equipped with advanced technologies. Their inventive catering team prepares a global palette of flavours ensuring your receive an unforgettable culinary experience. Irrespective of how small or large the size or scope of your event is planned to be, their professional staff, along with a technical concierge guarantees every detail of your wedding celebration is flawlessly executed. If this list doesn’t satisfy your search – we have many more banquet halls in and around Central Delhi that you can filter by price, capacity, type and features here.